Set in Dublin in the mid-1980s, Sing Street is a coming-of-age tale whose subject Conor (Ferdia Walsh-Peelo) is abruptly forced to transfer to the state-run school Synge Street after his family falls on hard financial times. One day after classes, he strikes up a conversation with an aspiring young model named Raphina (Lucy Boynton) and in an effort to impress her, Conor claims that his band is looking for someone to star in their next music video and that she would fit the bill perfectly. Of course, Conor isn’t actually in a band, so he hastily recruits some members for his new musical endeavor, including multi-instrumentalist and rabbit enthusiast Eamon (Mark McKenna). With his previous movies Once and Begin Again, Irish writer-director John Carney has kept music at the heart of his work and proves once again that few people capture the spontaneous energy behind music creation on film better than he does. His characters use their instruments and voices to bare their souls but the way they tell their stories through their music also helps the narrative grow organically from their emotions. Songwriters understand that ebullient feeling of putting just the right chords and notes together to make the perfect song and Carney puts that joy on screen for each musical number. Another emotional linchpin for me in this film was Conor’s endearing relationship with his older brother Brendan, played by Jack Reynor. A college dropout who has seemingly given up pursuing any personal goals of his own, Brendan sees the creative potential in Conor and acts as a sort of musical and spiritual mentor to his younger brother. Sporting an admirable LP collection and various bits of sage advice (“no woman can truly love a man who listens to Phil Collins” was my personal favorite), he makes it his mission to give Conor the kind of education that he could never get from his classes in school. The late night listening sessions in Brendan’s room serve as a bit of a respite for the brothers, with the boisterous sounds of the record player masking the shouting matches between their acrimonious parents. Elsewhere, Conor faces cruelty from both bullying schoolmates and oppressive teachers that threatens to extinguish the creative spirit he has worked so hard to cultivate. Carney adds these bits of real life anguish and torment to temper the typically cheery musical scenes and remind us that even though these characters find joy in creating and performing, it’s often in response to the less-than-ideal conditions of their personal lives. Of course, the quality of the music itself is key to appreciating this kind of film and the songs here are as catchy as the 80s pop tracks that inspired them. The band’s first hit “The Riddle of the Model” has a stabby synth lead right out of an A-ha single and the group’s best song “Up” has an infectious chorus that reminded me of Men At Work’s peak material. 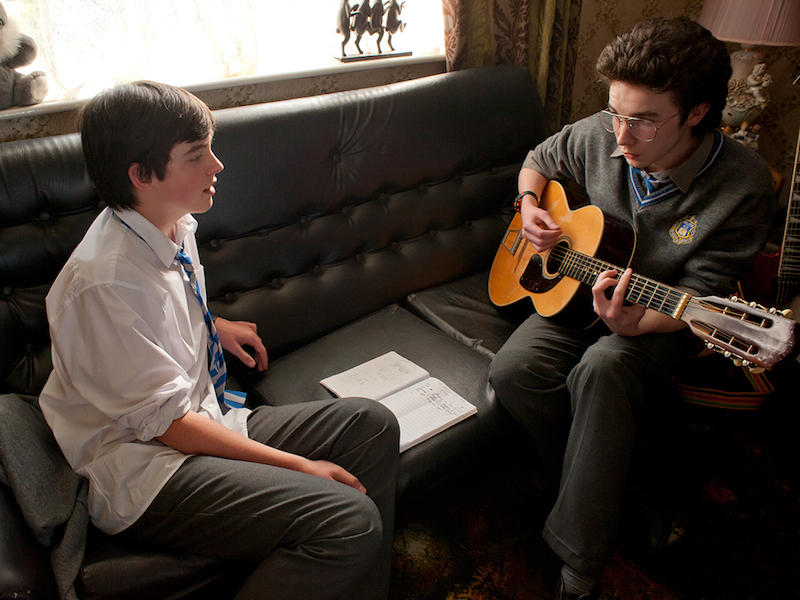 It’ll be a shame if none of these get nominated for Best Original Song next year but even if they don’t, Sing Street will still stand as another charming and vibrant victory for John Carney.